Kamayani Swami started delving seriously in the field of social change and development as a Masters student at the Tata Institute of Social Sciences (Bombay). After 17 years of formal schooling she had previously gone through kamayani, like many others, had a lot to learn and unlearn. She started her learnings and unlearnings in the real world as a full time worker of the Shramik Adivasi Sangathan (SAS, Beitul district, Madhya Pradesh), National campaign for the People’s Right to Information (NCPRI) and was associated with the Mazdoor Kisan Shakti Sangathan (MKSS) and with the Her learnings with MKSS have been guiding her work since. For the past decade she has been working in the field of social change and justice. 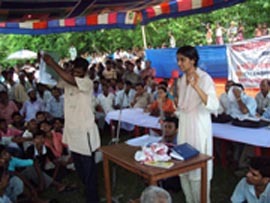 In 2008 she became part of the effort to mobilize workers of Bihar and form a rural workers trade union called Jan Jagaran Shakti Sangathan (JJSS). JJSS has empowered the rural community of Araria and Katihar districts of Bihar to struggle for their basic rights which is so easily denied by the corrupt govt machinery and vested interests. The work of the JJSS at the district and state level has helped workers get work and avoid distress migration. The JJSS has also been instrumental in initiating wide scale social audits (MKSS has pioneered social audits which means audit by the people) along with the government in Araria district to help curb corruption and to involve ordinary mass in the implementation and monitoring of the govt. schemes. In 2012, the JJSS was part of conducting ICDS Social audits, in East Champaran (Motihari) district, along with the ICDS directorate. The work of the JJSS has lead to greater awareness about the rights in the rural poor. Kamayani feels the JJSS with it’s gender, caste and class lens has tried it’s best to build a democratic and progressive organisation, within, while fighting the system outside. She and the JJSS hope now to expand in the field of inculcating progressive values in the younger generation.